with regard to the nuclear power station, which seems to be regularly on the news for various reasons. However, the fishing here can be superb with cod, bass and sole the main targets. Where structures play a part on a beach, fish are usually never to far away and Sizewell offers such features to draw the fish in. 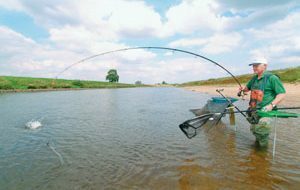 As well as offering some cracking fishing, there are in fact plenty of other goodies to offer you and your family if you should decide to wet a line here. 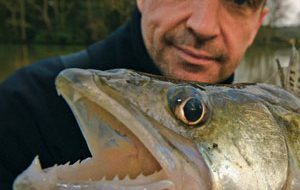 For the angler there are several features that attract bass, cod, flounder, eel, dab, whiting and sole at the relative times of year. As for the family, if they are with you there is a cafeteria and plenty of walks with sights to see, which should keep them occupied while you try to catch their tea! To get here from the A12, there are a couple of B roads that can be taken, the B1122 and B1191, then follow signs to the power station or Sizewell beach. On arrival, there is a big car park where a cafeteria is based and you can get a cuppa before setting off. Simply leave the car here and walk off to the various marks, some of which are quite a trek. From the car park, to get to this part of the beach is unfortunately quite a hike. If you decide to walk it, head off left up one of the formed tracks that makes for a bit easier walking. The further you walk the closer you will get to Minsmere, which is in fact the adjoining beach. The best time to approach this venue is towards low water when you can see the sand bar that goes along the beach about 150 yards out. Look for the gaps in the bar where the water is deeper, which will be signified by calmer water. The fish will come through the sand bar to feed and if you get your bait somewhere in this region, the fish have to pass it at some stage on the flood and ebb tides. Cod are the main target in the winter and bass patrol here in the summer. As you look out to sea from the car park you will see several structures jutting up. The one you want is the furthest left. It looks like a pipe sticking up out of the water. The choppy water here means that feed is always being stirred up, which in turn brings in the smaller fish. The better fish come in, attracted by the tiddlers and a food chain is formed around the entire area. Anything can make a show here and the key is to use the pipe as a line of sight for casting, or thereabouts, because the sea is continuously forming fish-holding areas. Fish at any stage of the tide with a variety of baits to see what is out there because you never know what kind of a fish might turn up. This spot is so known because it is the outlet pipe for power station B. It’s way out of range, so use it as a line of sight or even a reference point, then you can be sure that fish will not be too far away. This is because the outlet pipe is pumping warm water furiously, which has come from the power station. All this commotion draws the fish along the disturbance line created by the torrents of rushing sea water. In the summer, sole show in large numbers and, armed with a rig consisting of size 6 hooks and ragworm as bait, you can bag up with them. Bass are a regular catch here as well,, and a whole squid mounted on a size 4/0 Pennell rig should attract one. This is the same as outlet B, only it is reachable with a good cast. As you look from the car park, it is in fact straight in front and is probably the most favoured mark because of its proximity to the car park. It is a large platform that looks a bit like an oil rig and you can actually see the huge volumes of water passing out at the base of it from the power station. This attracts most fish, especially bass, because of the warmer water. For the best results fish on the left-hand side on the ebb and the right-hand side on the flood. This is because the tide creates a disturbance line from the outlet, which the fish will follow for the feed. Cast anywhere into this visible trail with various baits. Fish anywhere along this section because over the years much debris has been deposited by the boatmen, creating excellent fish-holding areas. It can prove to be a little bit snaggy but don’t despair as the rewards certainly outweigh the troubles. At the correct time of year sole can be prolific along this stretch and, if you load up size 6 hooks with ragworm, you will have a great time. You must use these little hooks because sole only have small mouths and your chances of setting a hook in one will be dramatically increased. Use a simple running leger rig cast short for best results. The house is situated to the right of the car park and is about a 10-minute walk. However, the walk is very easy because the ground is firm with grass and tracks. This area shows a few sand bars at various ranges, which always hold fish of one sort or another. Cast out a plain lead and reel in to find them, then cast your bait to where you located the gullies. Sole play a big part in the catch because food particles are carried by the tide from the outlets and deposited here. They can be found at different ranges because of the varying sea bed, so vary your casting ranges to locate which gully they are in. Always have a second rod out for the bass because they are also attracted by the abundance of feed. 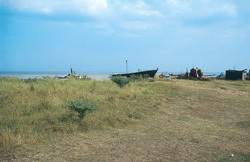 Southwold Angling Centre, 9 Station Road, Southwold, Suffolk, IP18 6AX, tel: 01502 722085.